Yeah, I know. Though technically it was less than two months ago, Thanksgiving already feels like a faint memory from months gone by. So I won’t dwell on details of that day’s feast that we enjoyed here at my house. The ginger-and-orange brined turkey that I grilled over mesquite-enhanced charcoal out in the garage. The mashed potatoes with fried sage. Stuffing with chanterelle mushrooms. All I’ll say is that it was, as usual, one of my very favorite meals of the year. And for days after, my garage smelled enticingly of mesquite-grilled turkey….. I am SO doing that again next year! One other item on the dinner table that night was particularly well received. It took the already-beloved scalloped potatoes to a whole new level with the addition of celery root. 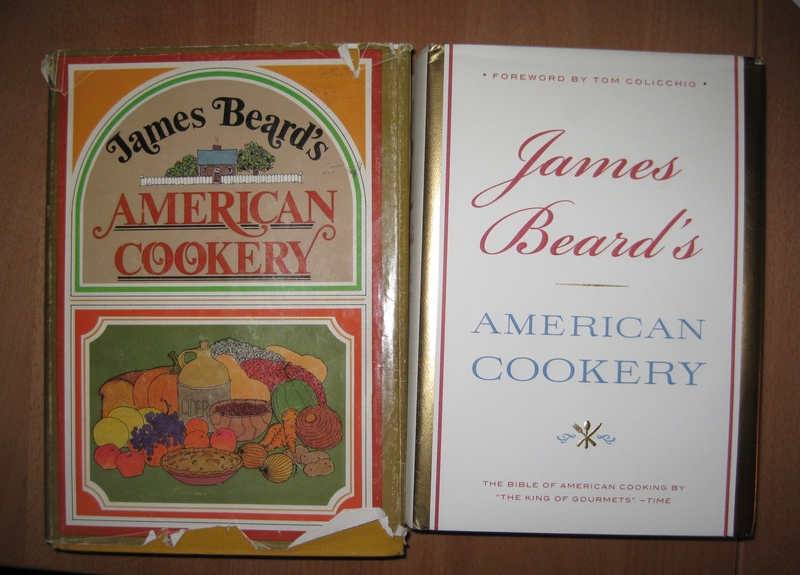 The recipe came from the recently-reissued James Beard’s American Cookery , a book that I have in its original 1972 form, one that’s been a standard go-to reference for many years. Beard’s larger-than-life culinary persona blended with his proud Northwest roots has long drawn me to his books for ideas, inspiration, perspective. He’s made me wish–in Hors d’Oeuvre and Canapés–that I could traipse back in time to one of those 1940s cocktail parties in New York where cocktails were made by the pitcher and delicate canapes were decked out with chilled veal and dainty shrimp with chopped egg. And long for one chance to picnic James Beard style à la Treasury of Outdoor Cooking, with wicker hamper that turns out lobster newburgh, a thermos of chilled martinis, bermuda onion sandwiches and strawberries in kirsch. Lord but that man lived the good life!! 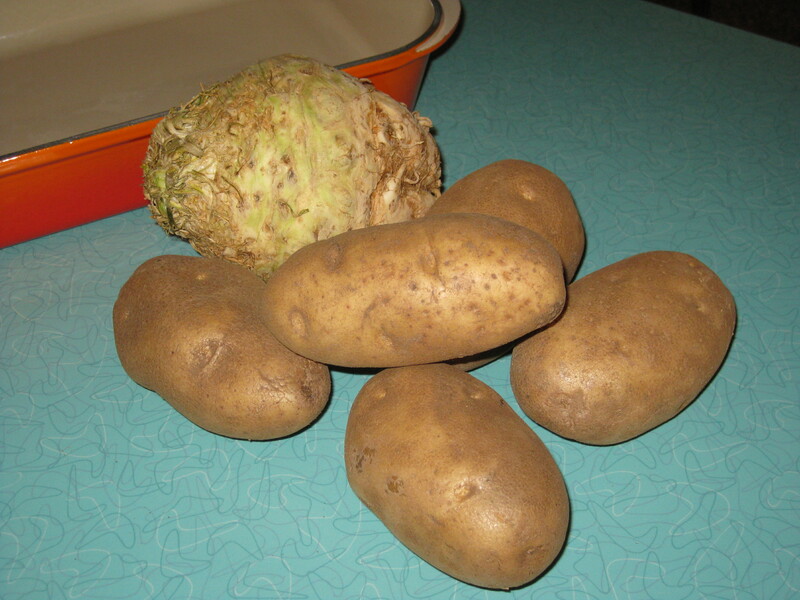 And he shared plenty of good food, fond memories and inspiring menu plans along the way…..
My first introduction to the knobby, ugly, deliciously nutty vegetable was during my culinary training in France and I became an instant fan. So I couldn’t pass up the opportunity to use Thanksgiving as an excuse to try this recipe. True to much of Beard’s style, it’s a simple preparation. His recipes may occasionally rely on rich, exotic or expensive ingredients but they’re rarely fussy. For this tasty side dish, first butter an oblong baking dish (I used my 9 by 13 Le Creuset baker). 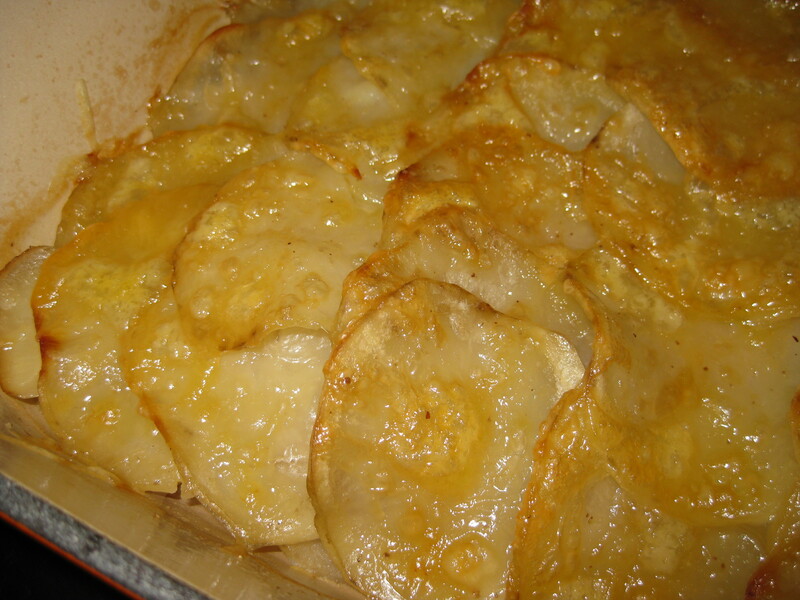 Thinly slice trimmed celery root and russet potatoes. Layer them with more dots of butter, sprinkles of salt and pepper. Pour beef broth over (I used vegetable broth to accommodate my vegetarian sister), cover with foil and bake. When all the goods are tender, off with the foil, on with a generous sprinkling of Emmenthal or similar cheese (such as Gruyère) to bake just until melted. It’s an easy recipe that boasts pure flavors that meld together beautifully. Pure Beard, all the way.